My friend Peter and I headed out Tuesday evening for our first frog run in southeast Ann Arbor (map of our route is here.) It had reached a high of nearly 70F and it was still in the 60s in the evening. So even though it was a little windier than ideal, we hoped frogs would be calling for one of the first times in the season. And we were right! We heard western chorus frogs (Pseudacris triseriata triseriata) at all but one location, and they were accompanied by spring peepers (Pseudacris crucifer) in one spot. Western chorus frogs remain at their breeding sites all year, liking to hide under logs, rocks, leaves, or soil when not in the water mating. 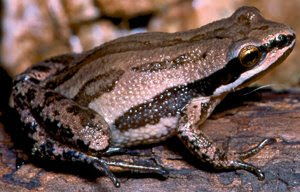 Chorus frogs are fairly abundant in Ann Arbor-area marshes, meadows, swales, damp woods, and swamps. All sites on our route are ponds (vernal and permanent) on the edges of woods or small wooded areas. Even in the ponds, they prefer dead grasses and reeds for camouflage. Peter made sound recordings of the frogs at two locations using his spiffy silver music recorder doohickeythingamabob. The first recording is of chorus frogs at a pond on the northwest corner of Stone School and Morgan Roads in southern Ann Arbor. The frog calls sound a bit louder than I remember, probably because the location is on a dirt road with few traffic/background noise distractions. The second recording is of a chorus of chorus frogs and a few spring peepers at a detention pond in Turnberry subdivision, at Turnberry Lane and Ca Canny Court (I'm not making that name up; all streets in that sub are named after golf courses in Scotland). The frogs actually sounded much louder in real life, even over the traffic noise from nearby US-23; I actually had to raise my voice so Pete could hear me! It was awesome, though of course it makes perfect scientific sense that frogs in detention would be more rowdy! I had hoped we might hear a wood frog (Ranus sylvatica) as well, as I've never heard this species in my five years of doing the frog and toad survey. They are "explosive breeders," which brings all kinds of unsavory images to mind, but which means they mate early in the season and only for about two weeks. I hope I haven't missed them. For more photos and another sound recording of chorus frogs, jump on over to Gerry Wykes of Naturespeak . Hi Monica, sorry I've not popped in for a while - but I'm finally back and, wow, I never knew there were so many different types of frogs and toads! Reading your posts is certainly educational! I don't think we have that many in the UK - I certainly haven't got that many in my garden, but the ones I have got are at it like......well, like frogs and toads really!Got loads of spawn in my ponds - lets hope for a good crop(?) of tadpoles later on. Oh, and your amyrillis in the earlier post is stunning! To read about specific species and have such great detail is wonderful. Monica, I really enjoyed those recordings. I used to hear the peepers every spring until my industrious farmer neighbor drained the wetland where they bred. I would love to listen to them sing at night as I fell asleep. I heard some frogs today! In the swampy area near my house. Love their songs. I want to attend the plant swap!!! Maybe i can. I will be back in MI by then. No Froggies here yet, but we are listening for them. I LOVED the recordings! So much fun listening to the frogs. I love the sound of frogs...you were really treated to a frog-fest that day! Thanks for treating us, too!! The photo is nice, too. I wonder if that sound would be good to use for a massage CD? I know it's been putting me to sleep lately. There is a retention pond nearby hidden in the neighbor's woods that must have thousands of frogs living in it. Thanks for the audio treat! Seriously, your friend ought to consider the massage market for his recordings. Oh what a funny post--rowdy frogs from a detention pond--I love it. I have a mental picture of froggies in leather jackets on motorcycles. I know, I need help! Hallo Monica, wir hatten auch mal kurzfristig einen Frosch im/am Teich. Ein paar Wochen danach waren auch unzählige Kaulquappen da, jedoch haben unsere Fische alle weg gefressen. Keine kleinen Frösche und keine Froschkonzerte. Darauf brauchen wir leider nicht mehr warten. Hi Monica, explosive breeders! That is just scary. Good for you and the frog study. That must have been fun with your good pal. Lots of frogs means the eco system is running well, doesn't it? Ca canny is a Scottish phrase meaning go carefully, or don't be rash. I wouldn't know if it's also a golf course. haven't heard that in a long time! The frog recordings are great - Here in the Santa Cruz Mountains I hear a lot of frogs, tiny things, I'm not sure what they are. I'll have to find out. It sounds way too early for frogs. I hope the warm weather holds for you. I'm still seeing nights in the teens so the frogs are still fast asleep. Aren't frogs wonderful? We're enjoying their chirrups and ribbits here, too. I feel so fortunate. Only bad thing is when my kitties catch one and pester it. They haven't killed one yet, thank goodness, and I sure hope they get to be lazier hunters as they grow older. Congratulations on that first crocus! Two of the 11 varieties of frogs and toads in my area are pretty rare, so I doubt I'll hear them. I'm still hoping to hear the wood frog, which hasn't quite started calling yet. Frog eggs get eaten by many, many creatures--that's why they lay so very many. Thanks! We'll hear different species as the weather warms. I prefer the chorus frog call to the peepers, but ANY frog calls make me happy to know they are in the area! I love to hear the American toads that sing in the vernal pond behind my house--last year it was too dry so they didn't come and I missed their songs. The area was looking watery up to a few days ago... don't know if rain will help. Frogs and friends and caffeine are good! Yes, I'm glad Pete has the recorder. See my comment to Debbi above--I'm amazed something is earlier here than in warm climes like Tennessee! It's really impressive IRL when you can hear from dimensionally where each frog is located, too! We'd done the same route a few years back and didn't hear nearly as many frogs. I do think the photo is cute, with the brown stripe extending over the eyes! I had to borrow it because we do the survey at night and don't see the frogs. It's actually pretty hard to do a recording for any length of time without car noise. Ja, die Kaulquappen (ein neues Wort gelernt!) werden von sehr vielen anderen Tieren gefressen... so geht es fuer Froesche. Yes, these frogs, too, are tiny, about the size of a fingernail. I used to write for the local paper and actually interviewed the builders for this sub--that's how I was told they were named after gold courses--wouldn't be surprised if they got that wrong, though!! Hmmm... maybe Michigan is somehow unique in that our earliest calling frogs have a=that antifreeze. Cool! Hi again! Your frogs are so large in comparison--though we do have a few bigger ones like the bullfrog. The two in the calls here are tiny, about the size of a thumbnail. They give you a CD with the different frog calls. Once you hear that over and over, it's easy to tell them apart in real life. Plus, you have directional cues in real life that don't translate into the recordings, which makes it easier to tell individuals apart.